Bulk Discount, purchase 4 at only $12.87 each! Bulk Discount, purchase 4 at only $15.04 each! Bulk Discount, purchase 4 at only $16.79 each! Bulk Discount, purchase 4 at only $19.99 each! Bulk Discount, purchase 10 at only $5.25 each! Bulk Discount, purchase 10 at only $5.92 each! Bulk Discount, purchase 4 at only $8.50 each! Bulk Discount, purchase 10 at only $3.01 each! Bulk Discount, purchase 4 at only $4.98 each! Bulk Discount, purchase 4 at only $10.58 each! 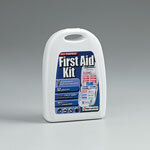 Be ready for all potential emergencies at home, in the car, outdoors or on the water. 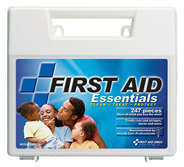 Our new generation of hard First Aid kit is developed to save time and frustration in the midst of emergency situations. 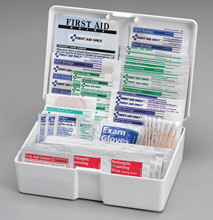 Supplies are easy to find in our newly designed organizer case. 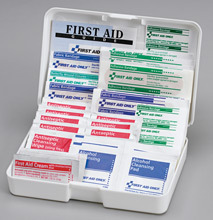 First Aid Kit Dimensions: 11-3/8"x10-3/4"x3"
First Aid Kit Dimensions: 6-5/8"x4-1/2"x1-7/8"
Special Savings on the 83 piece all purpose first aid kit!!! 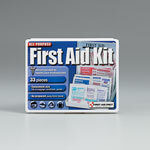 First Aid Kit Dimensions: 9-3/8"x8-7/8"x2-3/4"
First Aid Kit Dimensions: 4-3/4"x3-3/4"x1/2"
A medium sized kit in the clean, treat and protect family, this kit is great for the bumps, scrapes and bruises in life, containing plenty of supplies for your everyday first aid needs. 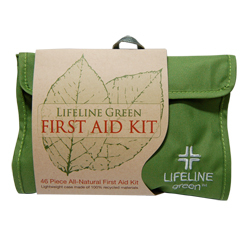 An all-natural first aid kit in a lightweight case made of 100% recycled materials. 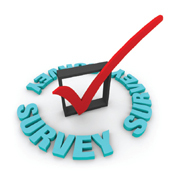 All topicals are 100% natural and the wrap is printed on 100% recycled material.